1) I do lots of different themes and menus: quiz night, Marmite night (where every dish contained Marmite), flower night (used edible flowers), Elvis night, Astrology night(where the meal was based on the chart of the night), Middle Eastern food night, and so on. They all sell. I didn’t do a Harry Potter night to sell tickets. I have no problem selling tickets, dates up until Christmas have been sold out for sometime. I planned this night because my daughter and I are fans of the books. 2) I support JK Rowling’s authorial rights. I am fully aware of the issues of people stealing other people’s work. I have the same problem. My training is photography, people steal my pictures all the time. People use the information and the writing from my blog all the time. Often they don’t ask. In my ignorance I hadn’t even thought that Warner Bros and JK Rowling would be bothered by a cook being inspired by the books to try to recreate the dishes. They are big, I am small. However Harry Potter is now part of the culture and a part of my daughter’s childhood, of this generation’s childhood, it seems heavy-handed to clamp down on every use of Harry Potter. 3) The Underground Restaurant is a home restaurant and asks for tickets to be pre-paid to cover the cost of the ingredients. If people don’t pre-pay, they often don’t turn up and I actually lose money. I can’t afford that. The dinners are my only income at the moment as it has become a full-time job. I have a child to raise. 4) I don’t make alot of money from the dinners. I keep prices low. Part of the reason I started The Underground Restaurant is because I can’t afford to eat out at many London restaurants, so I try to keep the price down. Each dinner takes at least four days work: shopping, ordering, prepping, cooking, the night itself, then cleaning up, laundry, ironing, start again. Then I blog it. I regularly do long hours. It’s no picnic. I no longer have a living room. There are sacrifices. And of course I can’t buy ingredients as cheaply as a conventional restaurant. Generally guests are well behaved and appreciative. You get the odd hurtful comment posted anonymously on websites. It feels personal, as it is in my home. It takes a certain courage to open up your home to strangers. However when you are in the public eye, so to speak, you have to take the rough with the smooth. I have never courted publicity, I’ve just been myself, and if people are interested in what I do, then that’s great. 6) I’d like to see a culture in which home cooking is appreciated. I just went to a top hotel where the main dish cost £30. It was practically inedible, tasteless and bland. But the food was so processed, so tampered with, a gelée of this, a mousse of that, a sous-vide here, a purée there, everything served in tiny puddles with smears and droplets of sauce which you couldn’t pick up with your cutlery, so I was reduced to scooping it up with my fingers … Why do chefs think they can improve on nature? I’d like to raise the profile of mother’s cooking too, for women do most of the cooking in the world, day in, day out, as opposed to a culture of male celebrity chefs. If you were an alien landing on this planet, turned on the TV, you’d think it was men doing all the cooking. 7) I don’t eat or cook meat. I do sometimes cook fish. Everything is cooked on an Aga. I do love Marmite. 8) I’m single and available. I’m a teensy bit desperate actually. Hence the terrible dates on my The English can Eat blog. 10) I’ve been doing this since the beginning of this year. I’ve always wanted a restaurant, but many restaurants go bust in the first year and I don’t have any financial backers. I love to cook. I have a beautiful flat, garden and an Aga oven so why not use it and share it. A living room restaurant is also a great little business from home. Perhaps I’ve forged a new career path? Delving deeper into my motivation for starting The Underground Restaurant, I always wanted lots of children, a big happy family sitting around a large table, eating, arguing, laughing, drinking. A bit, dare I say it, like the Weasleys. I guess this is my way of reproducing that vision. Please don't be downhearted. I love your blog, I love your writing and I find what you're doing inspirational. It shows such a generosity of spirit that it makes me rather sad to think of you being crushed, even momentarily, by the nitpickers, exploiters, naysayers and stealers. You're bigger than them. What you're doing is life-affirming, important and downright wonderful. Keep rattling those pans, even if you rattle a few cages in the process. Belinda, Maria and Licked Spoon. Thank you. I just thought I'd put up a little more information as some of the commenters seem to be frothing at the mouth about me 'profiteering' from JK Rowling's work. I just wanted, as it seems they couldn't be bothered to read the rest of the blog, to put things in perspective for them. Don't you mean 8, Rachel? I really hope you are not feeling disheartened by the comments. I honestly think the blogging world (and Muggle world) is a far better place for the existence of your Underground Restaurant and your blog. I really think what you are doing is special and unique-begrudgers be damned! What freaked me out from some of the previous comments was the feeling that Big (Warner) Brother is watching you… creepy. I can't believe the stuff people find to nitpick about – I think the Harry Potter theme is great! And I loved your writing about how much work putting on a dinner like that is – people need to read that. Oh my darling – we live in a bonkers world! I do so sympathise. I've been amazed reading this and the last post and the huge range of opinion posted in comments. Don't feel you have to explain yourself for making some small profit from your hard work. Why shouldn't you get paid? Who else would run a restaurant, do all the pre and post work necessary, and then do all the cooking, for free?!!! I bet if it was a certain celebrity chef was doing what you had proposed, they would be all happy dappy about it and writing 'great' reviews, but not a woman working from home, oh no! YOU are an inspiration. I am more inspired by you than false pretentious TV Celebrity chefs who presently dominate our TV screens. I know it is not easy to ignore hurtful comments, but look at it this way, 'they' are envious of your success, so revel in it. YOU are doing wonderfully for us home cooks, you write with 'heart' and I know you cook with love (though I have not had a chance yet to try, maybe one-day). So please continue to inspire. Instead of encouraging inventively conceived events to keep HP in public space and people's memories, by being heavy handed WB is acting quite short sighted and stupid. What a load of cheek. WB have just got themselves a whole lot of free publicity out of HPgate. F***k them! I can't wait to sample the delights at Marmite Towers when I'm next in London and I love reading your blog. Yes Scarlet why am I apologising for being paid for my hard work? I have to pay bills and live and eat and be housed. Mangocheeks: very heartening to know I'm encouraging home cooks. Hi Justin thank you. Marmite towers lol. You know I'm doing a sherry night in December? You're definitely on my list for the new year; we're very keen to come to a night at yours, and will book up soon. Don't worry, the people who count know and appreciate the effort and love involved! 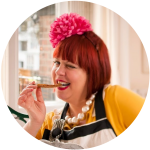 As a helper in the kitchen on one of the first dinners, I can confirm that MsMarmitelover works incredibly hard every week in order to produce these wonderful evenings where like-minded people can meet each other (unlike conventional restaurants). I hardly think that 'barely breaking even' every week constitutes profiteering. Keep up the good work! Hey, I just wanted you to be sure that I totally respect your basic business idea (dig it in fact) and your right to earn a living. I hope your business continues to grow (and maybe you should/could start charging a little more, so you do make a better profit as its your only form of income?) I totally don't wish to bring you down at all. But its not being a nay-sayer or nit-picking or bully to say that what you were going to do was illegal. It just plain was. (what's more you obviously know that). A small `crime'? Sure. Very minor. Maybe it should have just been ignored (although that raises the whole `so, where should we draw the line then?' question). Many of your other supporters don't even seem to want to acknowledge the basic fairness of copyright law (unlike yourself) unfortunately. So hey, everyone, isn't it great that the WB took the time to give a nice polite warning in advance, along with a suggestion of how the nights could continue without the little-bit of theft being involved? I mean they could have just waited until after the night and then laid civic charges instead. (Obviously that would be really, really stupid of them from a PR point of view, but perfectly within their rights legally). I fail to see how standing up for ones rights, hard fought for in courts, becomes petty just because your sucessful (like Warner Brothers). I mean its great to want to defend `the little guy' against oppression, but no one is being denied anything they'd otherwise be entitled to here. Rights are rights and equally binding regardless of the status of the individual or company involved. That's what's so great about them. Oh yeah and its not `heavy handed' it's a legal requirement of trademark law to issue notices to any and all infringements you become aware of. WB aren't aloud to chose to ignore a single case even if they wanted to. But I totally appologise for insinuating in my first comment on your previous post that your intended use of the harry potter theme was in anyway economically driven. I should read the rest of your blog better beforehand. Im glad that your other theme nights do equally as well. A big hug to you – what you do is inspiring and different and wonderful. Stuff anyone who is unkind to you and your efforts. They are obviously just not very nice/sensitive people. It takes a lot of hard works and guts to do what you do and these people obviously overlook this. I always think if you haven't got something nice or helpful to say then don't say it. It says more about the person doing the talking then the person being attacked.